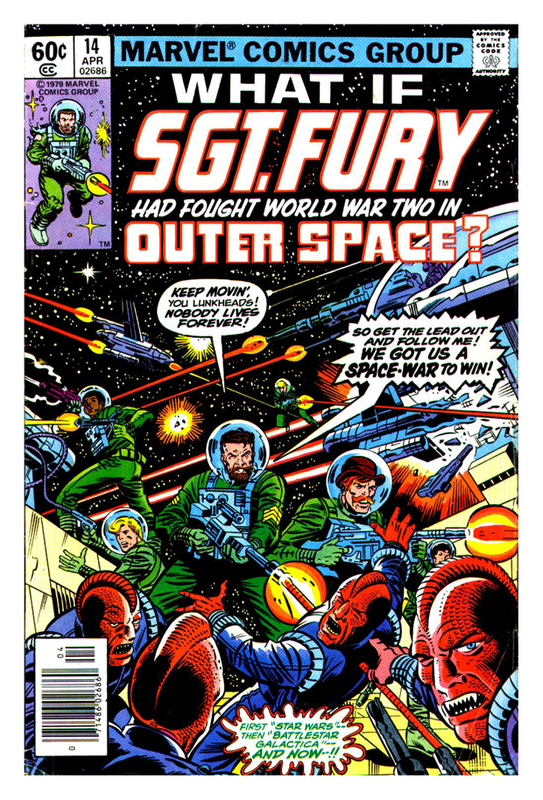 scans_daily | What If #14 - Nick Fury fought WWII... INNN SPAAACE!!! What If #14 - Nick Fury fought WWII... INNN SPAAACE!!! Uatu, don't quit your day job. You're no Laurence Olivier. Guessing this was the reality Ultimate Reed Richards was talking about in that bit in New Avengers. Which, given the multiverse was recreated by Franklin Richards, makes sense. World War 2 In Space is the sort of thing a kid would do. And referencing it is exactly the sort of thing Al Ewing would do. okay so this is less a "what if..." and more of a sci-fi story using familiar characters. Yeah, it's more like one of DC's "Elseworlds" ("What If...Batman fought Jack the Ripper in Victorian London?"). I assume it didn't go over well, since afterwards they mostly stuck to the familiar formula of "key event in Marvel history goes differently". That is some wacky stuff. You can tell they hadn't quite settled on the classic What If formula that early on. I love Sam Sawyer's commitment to his pipe and Fury's to his cigar. In spacesuits no less. That's nothing compared to Dum Dum Dugan's bowler hat. At one point it falls in front of his eyes and he can't fix it while it's in the helmet... and he keeps on wearing it. And none of this can compare to Gabriel Jones's Sonic Laser Bugle, which is activated by the force of his breath inside his helmet. Um.. a... the Watcher's pose in that final panel. I um.. am glad for one that it is a very far away shot for fear we might be seeing something if it was closer. "I AM FURY, THE UNSEEEEEEN, AND THIS WORLD IS PRETTY FUCKEN RAD"
As soon as I saw "Alpha and Beta Sectors on either side of the sun" I knew we were in for a time. Like... does that mean Earth is constantly going into enemy territory, or do the sectors ROTATE as the Earth and other planets do, or or or or... oh, wait, here's twelve other things that don't make sense either. My favorite detail, though, has got to be all the cigar and pipe smoking that gets done in outer space, some of it inside astronaut helmets. Um, guys, are you sure you should be smoking in space? You don't really have a lot of oxygen to work with and.... no? You sure? Alright I guess you know what you're doing. The human-robot subplot is kinda interesting, with LMDs in mind..